THIS TIME WE’RE DOING STOUTS! So get ready to learn about the popular dark beer and taste a few different ones! Our Beer 101 segment is all about yeast! If you don’t know about Beer 101, we take the first 15 minutes of every beer share to learn more about beer with Home Brewed Events! 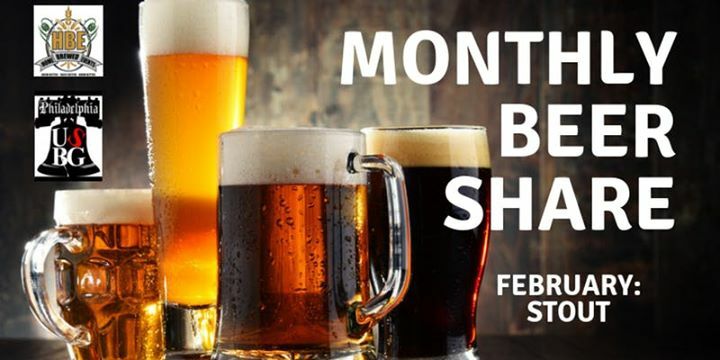 For those of you unfamiliar with beer bottle shares, they are gatherings of beer lovers where each attendee brings a bottle to share with the group. These exist for wine, beer, cider, etc..
Tickets are free for USBG members and $15 for non USBG members at the door. Make sure you bring 2 of the same bottle of any stout beer. During our beer share, we want the atmosphere to emphasize fun with education being a benefit from Cicerones being there to guide everyone. Any questions? Please contact Micah Messinger micahmessinger@gmail.com, Long Jawn SIlvers on Facebook, and cell 267-634-9355.